We dropped our Best Bet yesterday as the Bruins fell 5-2 to the Rangers despite outshooting New York 37-24. However, in our first day of posting leans on all the games, those leans went 7-4-1. They’d have been 8-3-1 if the Blackhawks and Stars hadn’t gone scoreless in the final 33 minutes after combining for 5 goals in the first 27. We received some feedback from a few readers about the new format we rolled out yesterday (breakdowns and leans on every game on the board), but we’d still love to hear more: what you liked, and especially what you didn’t. 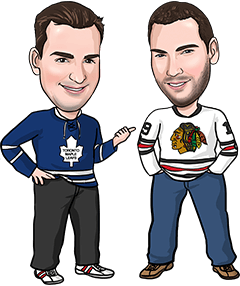 It’s a work in progress and we envision the writeups and previews being even better in the future, but knowing what’s most important to you as a hockey bettor will help us determine the final product. Also, please feel free to weigh in with your opinions below the posts in the discussion area: who are your leans for tonight’s games, and more importantly why. We’re going with 1 Best Bet again tonight, followed by breakdowns and leans for the other 5 games in Sunday’s action. The Oilers got a big monkey off their back last night in New York, snapping a 3-game winless streak with a 4-3 shootout win over the Islanders. Detroit was off last night after dropping a 5-3 decision to the Jets, the Red Wings’ fourth straight loss. Defence has been at the root of Detroit’s recent slump. They’ve allowed 14 goals in their last 3 games, including 4 in the third period Friday. Edmonton’s also been struggling defensively lately, allowing 13 goals in its last 4. With Gustavsson making his first start of the year in net for the Oilers and Edmonton’s offence getting back on track with 7 goals in the last 2 games, we expect both teams to contribute to the scoring tonight. The Avalanche and Blues both play for the second straight night and third time in 4 nights. Colorado beat Minnesota 1-0 at home yesterday, while the Blues rallied for a 2-1 OT win over the Blue Jackets. St. Louis has still scored just 7 goals in its last 6 games, and Colorado has scored just 5 goals in its last 5 contests. New Jersey lost 4-1 last night in Tampa Bay and has yet to earn a road victory this season (0-3-2). Carolina also played last night, winning 3-2 in a shootout in Nashville. This is just the Hurricanes’ third home game of the season. The Blackhawks carry a 5-game winning streak into the second game of this home-and-home series with the Stars. Chicago won last night’s game 3-2, when the teams combined for 5 goals in the first 27 minutes but then did not score again. Dallas has lost 4 of its last 5 games and 5 of its last 7. The red-hot Rangers look for their 8th win in 9 games tonight. New York won 5-2 last night in Boston despite being outshot 37-24 and resting Hendrik Lundqvist. Winnipeg is coming off a 5-3 win over the Red Wings Friday night, when the Jets scored 4 goals in the third period. The Jets have won 6 of their last 9 versus the Rangers. The Flames hope to win for just the second time in their last 30 visits to Anaheim. Calgary has lost 3 of its last 4, including a 5-0 loss in L.A. last night when the Flames were outshot 39-24. Anaheim was off last night after beating the Coyotes 5-1 Friday. Ryan Getzlaf is expected back in the lineup for the Ducks, but Ritchie and Kessler may be out.